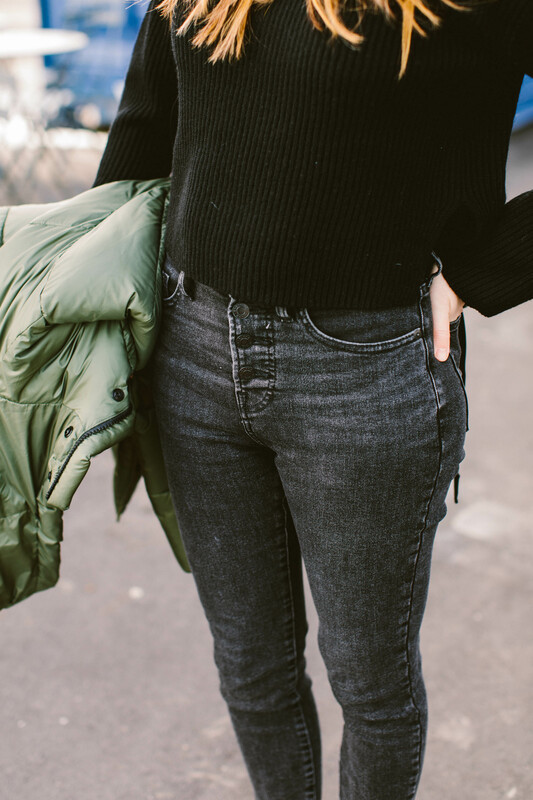 I tried Everlane jeans for the first time last month, and I freaking loved them. 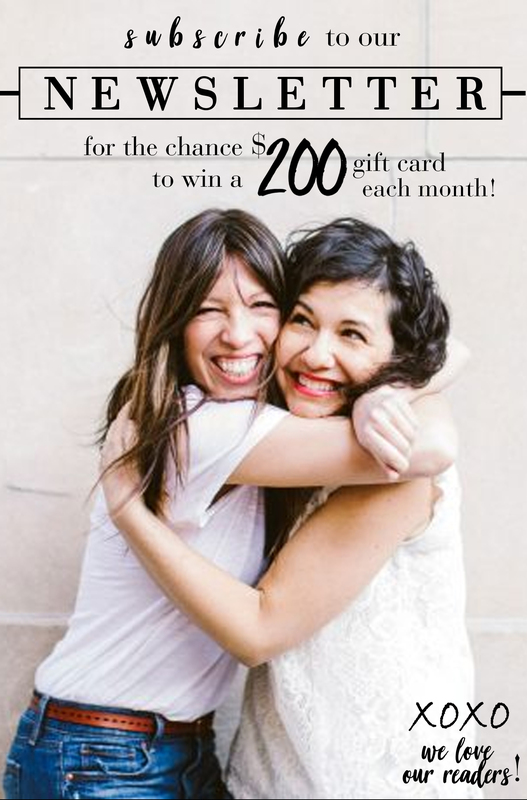 They had been on my radar for a while — Julieta and Laura are both HUGE fans — and it’s hard to believe they’re under $100. 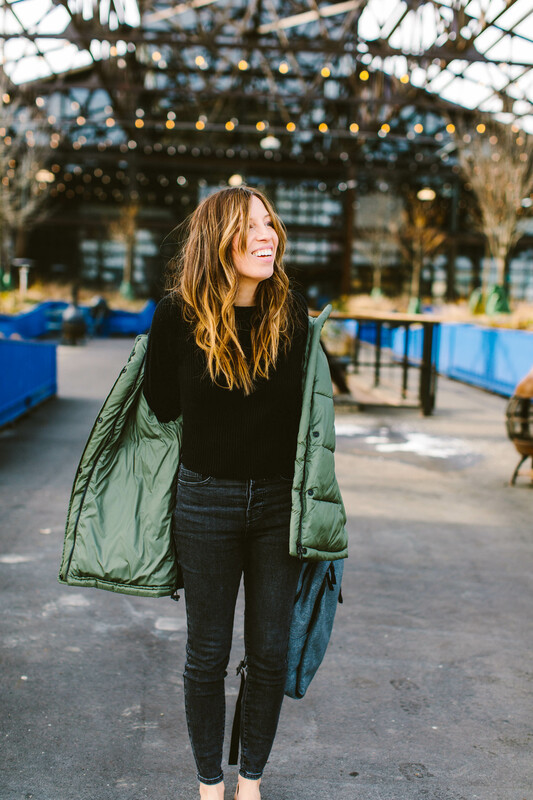 So when Everlane reached out asking me to play around with their latest pair of denim…especially since their latest is also a washed black, high-rise, button detail pair (aka my favs)…easy decision. 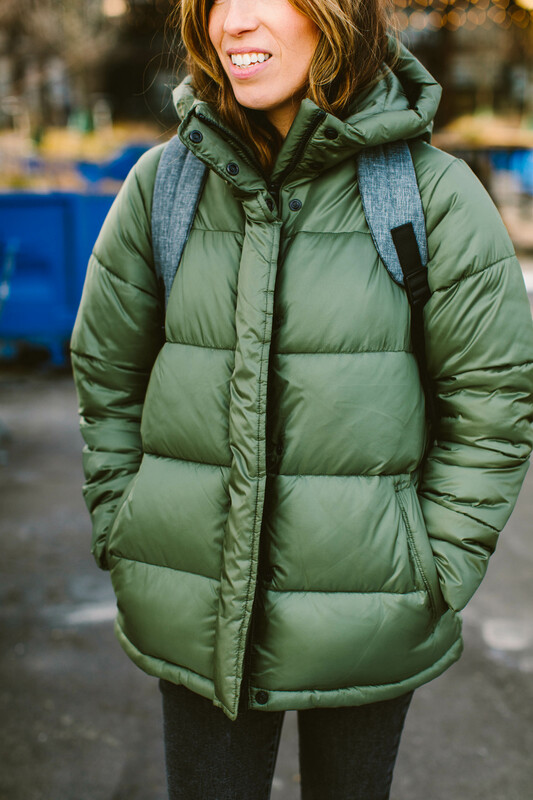 Since we’re in the dead of winter, I paired the black jeans with an army green puffer jacket (named The Puffy Puff, I kid you not). Black + army green isn’t the most innovative of pairings, but it’s useful, and one I suspect many of us fall back on. The best part? The black + army green combo is soft enough to be a perfect backdrop for pretty Spring colors like blush pink, yellow, and even orange. 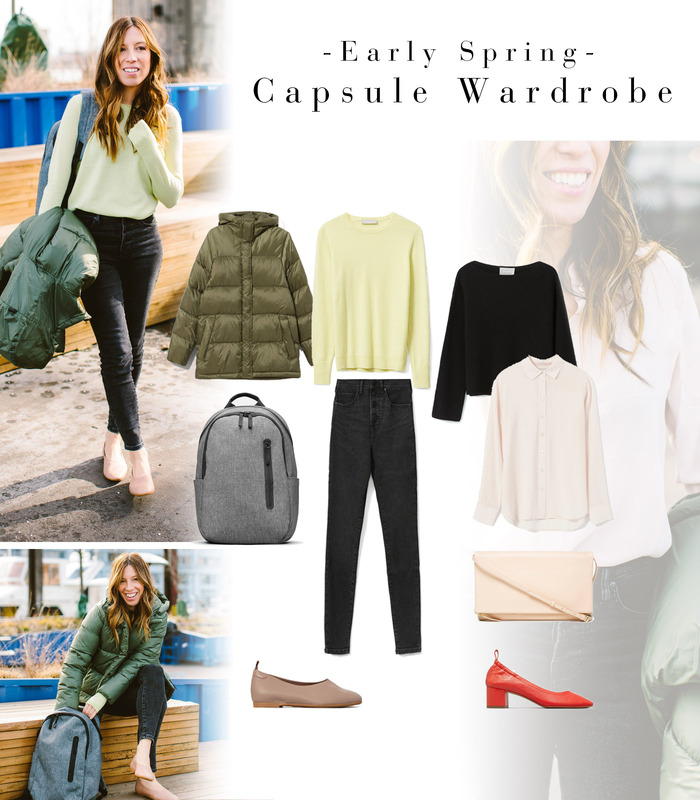 And so I pulled together a late winter/early Spring capsule wardrobe that combines some go-to neutrals with the colors I’m really excited to wear this Spring. This one works because it’s really hammering home the fact that army green is a neutral. And piling neutrals upon neutrals always looks chic. 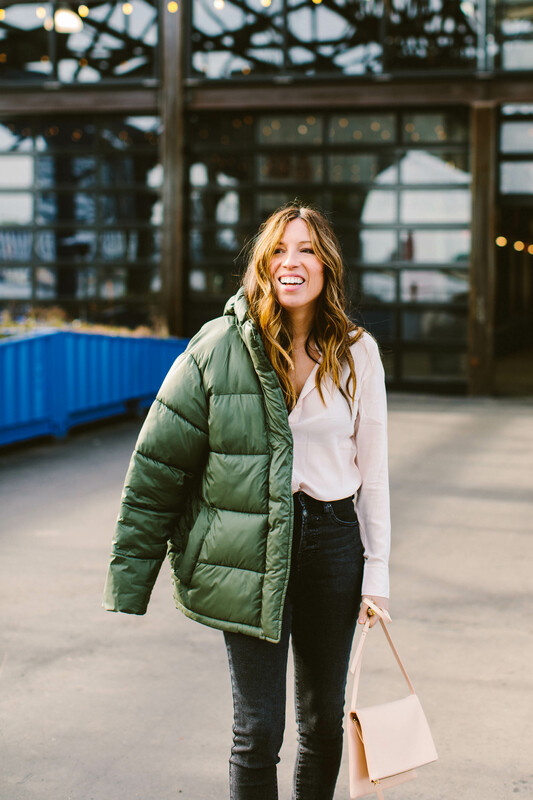 jacket: Everlane Puffy Puff (size xs for reference) – This unapologetically oversized puffer is made from 100% recycled material, and is nice and warm. The shape feels fashion-y (and is surprisingly easy to wear). sweater: Everlane cashmere ribbed boatneck sweater (xs) – LOVE this one. The cashmere is thicker than other Everlane cashmere sweaters, and insanely soft. The cropped shape is perfect for high-rise jeans. shoes: Everlane Day Glove flats in tan – WHOA. Easily the most comfortable flats I’ve EVER worn. The leather is seriously buttery soft. Highly recommend. Fits TTS. bag: Everlane Commuter Backpack – such a good backpack for when you don’t need to carry a ton. I love that it’s not overwhelming in size. 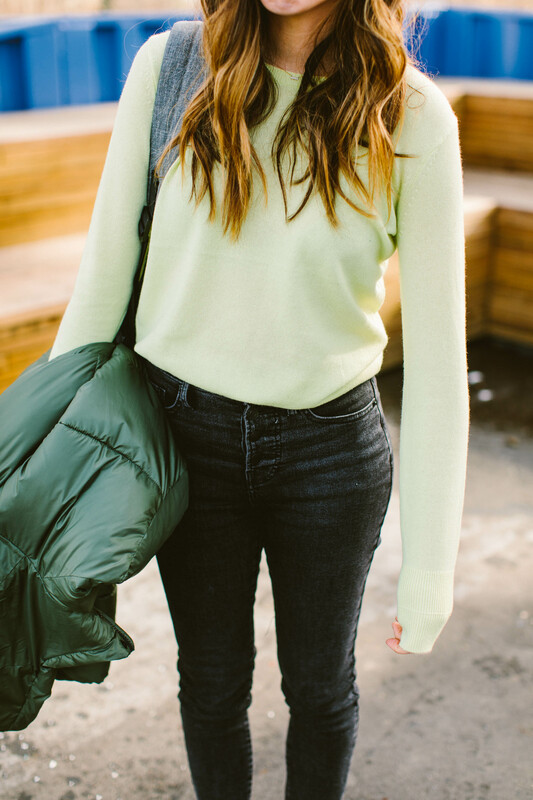 This cashmere sweater is surprisingly easy to wear — the color is just barely over the neon line — and looks so freaking cool with army green. The black jeans and tan shoes are a perfect counterpoint to all that color. shoes: Everlane Day Glove flats in tan – Easily the most comfortable flats I’ve EVER worn. The leather is seriously buttery soft. Highly recommend. Fits TTS. 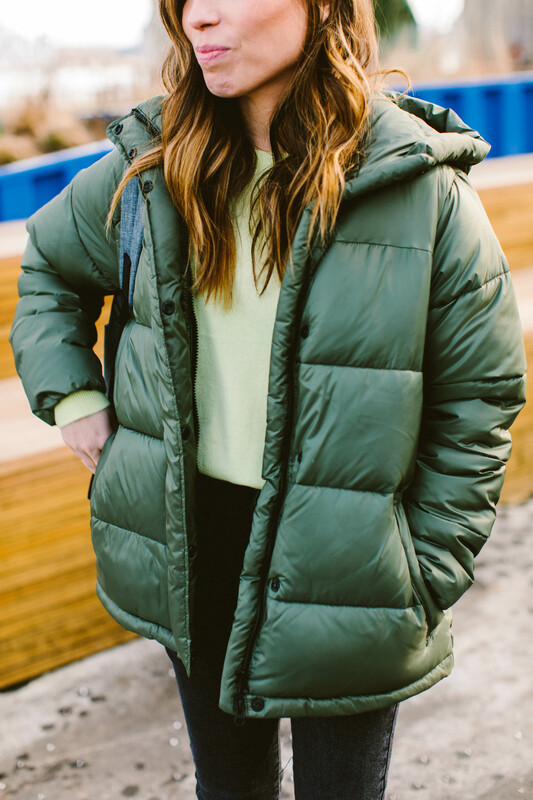 jacket: Everlane Puffy Puff (size xs for reference) – This unapologetically oversized puffer is made from 100% recycled material and is nice and warm. The shape feels fashion-y (and is surprisingly easy to wear). top: Everlane Clean Silk Relaxed Shirt in pale pink (xs) – I love Everlane’s silk shirts. I’m wearing this one over their new comfy bralette. So cute. shoes: Everlane Day Heel in bright red – The leather is seriously buttery soft. Highly recommend. Fits TTS. 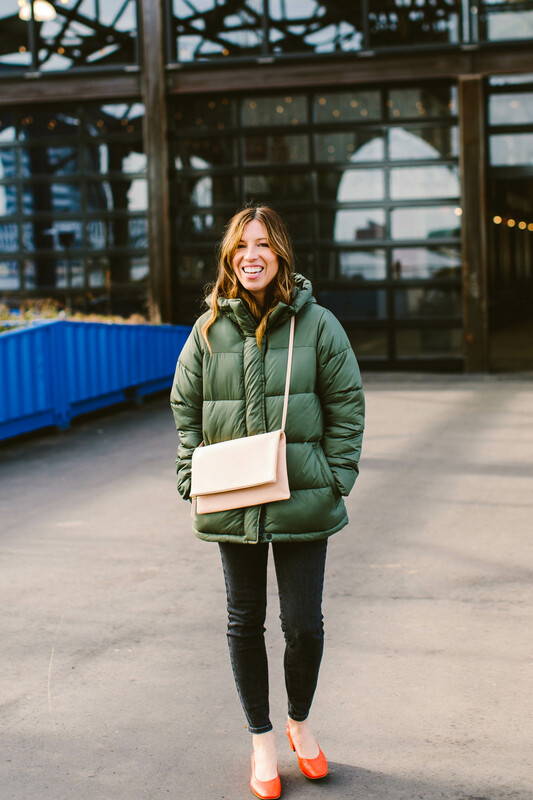 bag: Everlane Foldover Crossbody – Such a pretty bag to brighten up winter (and will be perfect come Spring/Summer, too). 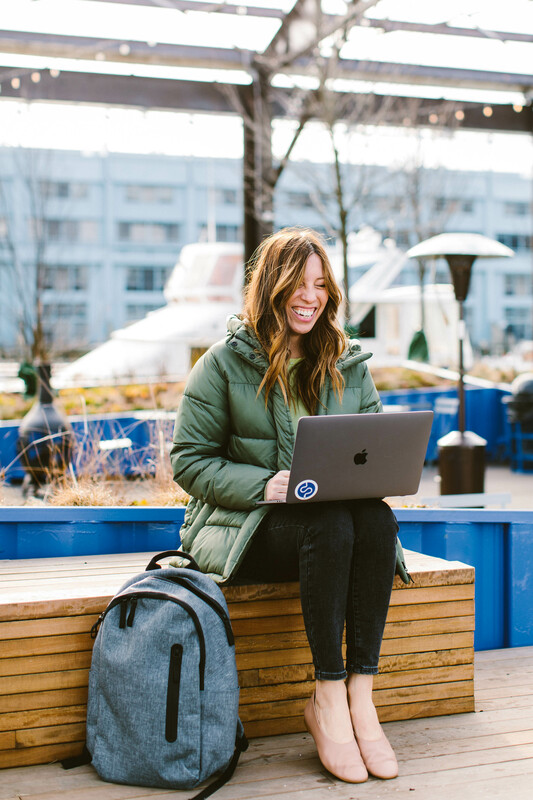 A huge thank-you to Everlane for sponsoring this post!! The entire team is now a huge fan of the brand – both the styles and the transparency. We love working with you guys. As always, all thoughts, opinions, and product choices are my own. And readers, thank you for your continued support. It doesn’t go unnoticed and is so very much appreciated. 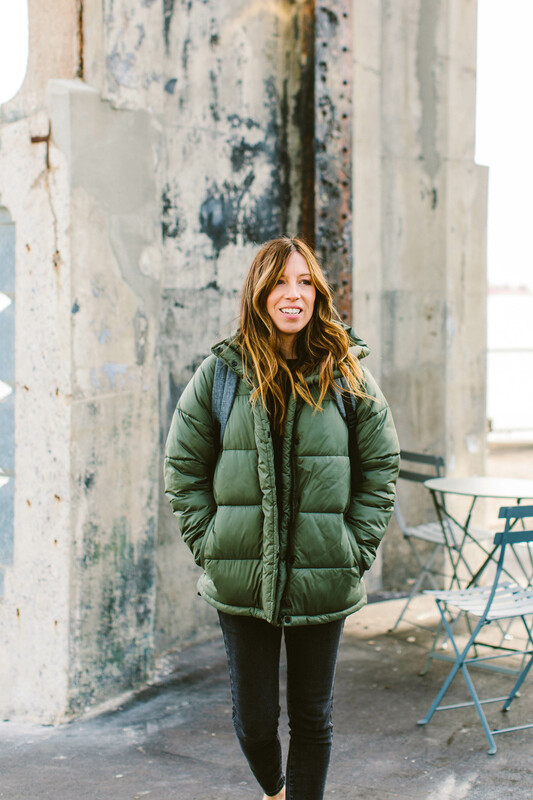 Next Article “THE Coat”: Is the Orolay Jacket Really All That? I have serious hair envy right now. Any fit notes you can share about the jeans? I know you are teeny tiny but is 25 your usual size? Info like size up or size down or TTS would be great. Are they snug in the waist? Faded black jeans are my most favorite thing but I’m suspicious that the high rise on those is too snug in the waist (my belly does not wish to be oppressed). I actually just ordered the day glove flat and was surprised with how comfortable they were. I ordered them in navy, but didn’t love the color. After stressing about which color to exchange for, I chose tan. Glad to see the tan looks so good in Shana’s pics! I LOVE the tan. Now just waiting for Spring…. You bet. Like you, my belly does not wish to be oppressed. 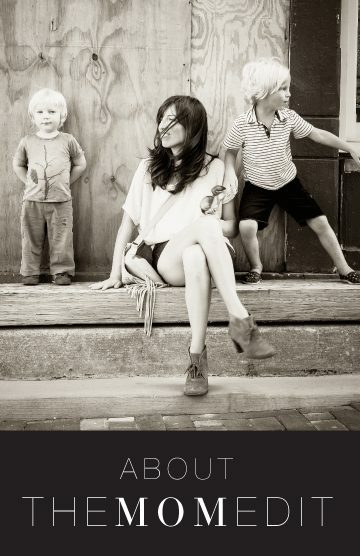 And while I often do a size 24 in AG and rag and bone jeans…I found that a 25?was much more comfy on my stomach. Wondering if the day glove flat gape when you walk – I love the look but hate gaping! I have the non button fly, high waisted skinny jeans in black. I’m normally a 25 in jeans. I sized up to a 26, and they’re still tight. I just got those exact Day Gloves a few days ago! I wore them around the house a bit, then today I decided to take them out into the real world. They do not gap (Meg), but they definitely take a bit of time to stretch to fit your foot perfectly. I am still feeling rubbing on the backs of my heels (which I get with 100% of all flats) and in one spot on the top of my left foot that must be a bit bigger or otherwise weird. I get an 8.5 in most shoes because I hate having shoes touch my feet (I know that sounds insane), but I’ve learned that flats will just flop and make you miserable if they’re too big, so I trusted the Everlane recommendations to get my “true size” in these – so I got an 8, and I *think* they will probably end up being comfy after my overly sensitive feet get used to them. As for the jeans (Annie), I found them to be overly tight in the waistband even when I went up one inch from the size I get in Loft jeans — and the worst part was that they bagged out in my legs immediately, and they were supposed to be “skinny.” Now, I am an odd shape – I have a lot of fat on my stomach (so I’m 100% going to be constricted by any non-stretch denim) and my legs are athletic but still fairly thick, and I was honestly shocked that the pant legs bagged out so badly on my large-ish legs. With the too-tight waistband and the too-loose legs, my Everlanes have spent most of their life on my closet shelf. I am still interested in trying their jeans that have a bit of stretch, but I’d be way more cautious about testing them around the house for a while before deciding to keep them.